Making Chocolate Bars | The Art Of | Kids VT - small people, big ideas! "Do I have to wear one of those bonnets?" 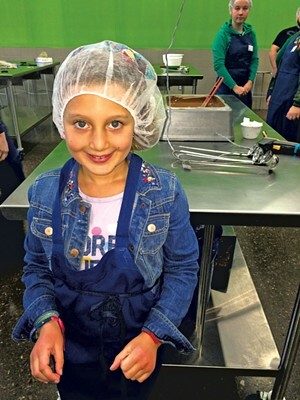 my 7-year-old daughter, Mira, asked, eyeing the hairnet-clad participants in our chocolate-bar-making class. When I informed her that yes, hairnets were required, she reluctantly put one on. "I look weird," she proclaimed. 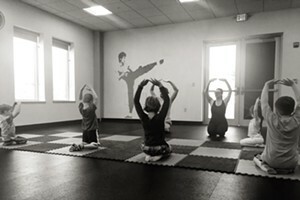 But once the class at Burlington's South End Kitchen got started, she quickly forgot about her unfashionable headgear. Eighteen of us — three kids, the rest adults — bellied up to a long counter at the front of the Education Kitchen. Photos of the chocolate-making process flashed on a screen above us as Education Kitchen coordinator Ashley Fitzgerald explained that chocolate comes from pods grown far from Vermont, in the warm, humid cacao belt located between 20 degrees north and 20 degrees south of the Equator. She passed around some cacao nibs to sample. I enjoyed the nutty flavor of these dried and fermented pieces of raw chocolate, despite feeling a little like I was chewing on coffee beans. But Mira promptly spit them out. She was happier with the next sample — a selection of white, milk and dark chocolate chips. Fitzgerald directed our attention to the metal vats of melted chocolate behind us. It had been heated overnight to 120 degrees, then cooled to around 90 degrees. This process, called tempering, is what gives the end product a glossy finish. Tempering also gives chocolate a smooth texture and that satisfying snap when you break it. Making chocolate bars is simple, albeit a little gooey. Each participant got a plastic mold containing chambers for four square bars. We started by filling each two-ounce chamber with Fair Trade milk or dark chocolate from manufacturer Barry Callebaut. My mouth watered as I watched Mira ladle the silky, fragrant stuff from a big metal vat into the mold. I resisted the urge to grab the ladle out of her hand and do it myself. 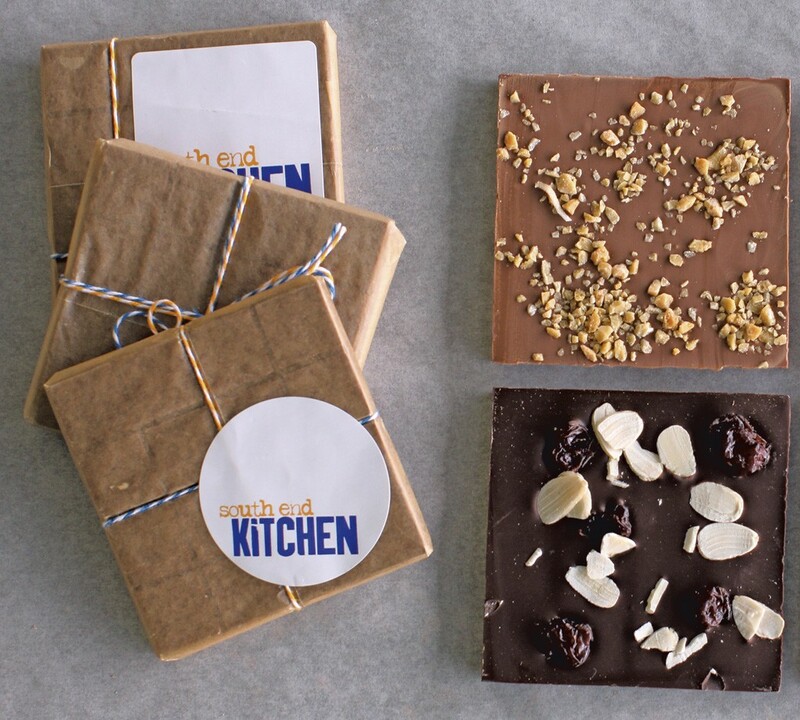 After banging the mold on the table to burst any air bubbles, we customized our bars by adding an array of fun ingredients, including roasted nuts, dried cherries, Rice Krispies, white-chocolate discs and sea salt. "The topping part really wowed me," Mira declared when we were finished. We decided two of our confections would be kids' bars, for Mira and her 5-year old brother, Theo, and two would be adult bars, for me and my husband, Jeff. We scattered toppings all over the chocolate's smooth surface, making sure the chili flakes ended up only in the adult bars. After securing our toppings with a final drizzle of chocolate, we handed our mold to Fitzgerald's assistant, who popped it into an industrial fridge so the bars could harden. While we waited, Mira and I created labels to adorn each bar, naming the candies according to their characteristics. "Minty" was a milk-chocolate bar studded with mint-candy pieces, while "Hot Coco" had toasted coconut, almonds and chili flakes. The bars only took about 15 minutes to solidify and fell easily out of the mold when we flipped it. After wrapping them in parchment paper, secured with a sticker, and tying a cute cotton string around each one, we were finished. Mira and I marveled at how professional our confections looked. "I'm totally telling everyone in my class I made chocolate," Mira told me as we walked out of the Education Kitchen. "I'm the chocolate queen!" 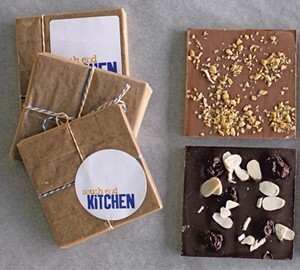 South End Kitchen offers chocolate-bar-making classes several times per month. Hour-long chocolate-bar classes cost $25 and are geared to adults and kids ages 6 and up; kids under 9 must be accompanied by an adult. In February, special Valentine's Day-themed chocolate classes for kids cost $35. 716 Pine Street, Burlington.